Frank Brusca is a George R. Stewart Scholar with a special interest: U. S. 40. He discovered the book when he was a boy, and it has shaped his life since. Frank’s goal is to re-photograph as many of the places Stewart photographed in 1949 and 1950 as he can, to record the changes over time. Geographers Tom and Geraldine Vale did that for their 1983 classic U.S. 40 Today, which tracked changes over the 30 years since GRS published his book. Brusca has more elaborate plans – he’s including color and virtual panoramas of some sites. Last Sunday, Frank held a web meeting for a small group of road scholars, describing his project in detail and showing his photos of the GRS sites on the old highway. It was impressive to see how much he’s done so far. His work, like that of the Vales, expands Stewart’s ground-breaking book. Brusca has a deep understanding of Stewart’s book. During the web session, Brusca revealed how to identify a first first printing of U.S. 40 – one photo is a mistake, so the book was pulled and corrected. (The photo, from a Hogback ridge west of Denver, was supposed to show the town and valley to the west of the ridge, but a photo from the ridge showing the eastern view was printed.) If you have a copy with the wrong photo, you have an early first printing. His knowledge of the book and the highway helped my GRS biography. Brusca directed me to German Filmmaker Hartmut Bitomsky, whose U.S. 40 West was inspired by Stewart’s book. Bitomsky agreed to a long interview about the film and Stewart’s influence on the work; much of that interview is in my book. Frank is off on a road photographing trip this summer. He drives from Massachusetts to San Francisco, and then zips back, photographing as he goes. (I hope to join him for one or two days in Calfornia.) He will also copy some of the original negatives for U.S. 40, in the Bancroft Library. All of this is expensive. Just copying the Stewart photographs in the Bancroft would cost more than $5,000. So far, it’s been self-funded. But now Brusca has a Kickstarter proposal to help fund the effort. If you’d like to help, you can do so here. A small 30 dollar pledge gets you an ebook with all of the 120 photos he’s planning to put in the book. More important, you become a patron of continuing the U.S. 40 work of GRS, the Vales, William Least Heat Moon, and Frank Brusca. The last few weeks have brought some interesting comments and communications from several places. A student in Germany who’s doing a dissertation on science fiction and GRS, an academician who wants to translate one of GRS’s books into an Asian language, a professor in Philadelphia who sent his students’ reviews of Earth Abides, and the Keeper of one of the Disney blogs (THE Disney Blog, in fact), asking to mention the posting about GRS and Disney. But the most interesting of all popped in just a few days ago – Christopher Priest, sending a link to his article about the influence George R. Stewart had on his work. I knew Priest’s name, but went to the web to find more detail. Christopher Priest is a distinguished, award-winning author of complex, literary science fiction written with a light touch. One of his novels, The Prestige, was made into a film by Christopher Nolan. (The ending of the film differs from that of the book, and seems to weaken the effect Priest so skilfully created in the novel.) Priest’s other novels get excellent ratings from readers and critics. Here‘s a list. Priest’s comment to the EA/GRS weblog was short, a link to a review of another author’s book. “Standing On Shoulders” refers to Newton’s comment that he was merely standing on the shoulders of the great minds who preceded him. In his case, Priest writes that he stands on the shoulders of filmmaker Ingmar Bergman and George R. Stewart. At about the same time, Priest discovered Earth Abides; and, thus, George R. Stewart. I”ll not go into detail here – read his article if you will – but I’ll say that in our brief conversations since his first comment to the web logwe’ve had some interesting talk about GRS and his brilliance. Priest and I also had an interesting back-and-forth about the definition of “science fiction.” Stewart’s best novels are all, in the purest sense, science fiction – that is, fiction based on and about solid science. But few readers would see Storm or Fire as conventional science fiction. Only Earth Abides qualifies. Does that mean we need to come up with a new term to describe the type of fiction which is set in the future, or a parallel universe, or on an alien world? Priest has proposed “visionary realism,” an excellent term but not yet popular with fans of the literature. Maybe one of the readers of this post will have an idea? If you’re on this page as a Stewart reader, I strongly encourage you to pick up one of Christopher Priest ‘s novels. (I’m ordering a couple on payday.) 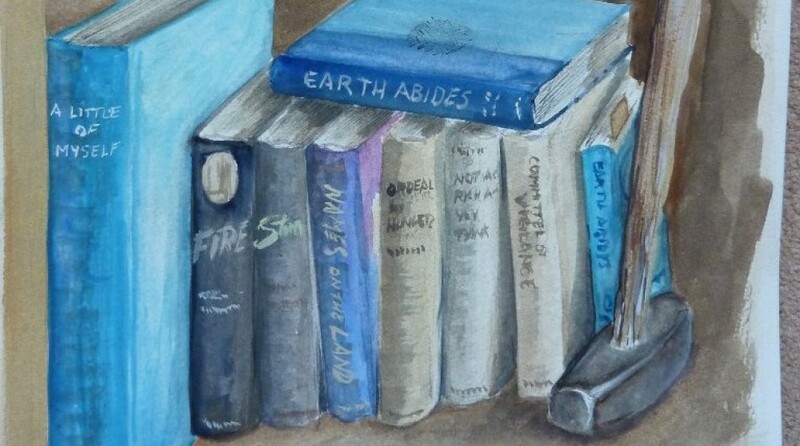 If you’re here as a Christopher Priest reader, welcome – and I suggest you read Earth Abides. I also suggest GRS’s Sheep Rock. That novel has some of rich complexity and layers of truth which are the hallmarks of Christopher Field’s work. It was a pleasure to learn that Christopher Priest found this weblog interesting, and I’m honored that he’s joined this conversation. The circle of George R. Stewart is growing; and in the best sense of the STEAM movement, connecting art and science. A small interdisciplinary fellowship of GRS followers is building, and that’s a good thing.